Would you like to save BIG on your energy bills while providing for an endless supply of hot water for your home? Are you ready to say “goodbye forever” to cold showers when the kids have used up the hot water? If so, then a tankless water heater is the ideal solution to your hot water needs! What’s A Tankless Water Heater? Regular water heaters store a lot of water inside a tank and keep it heated all the time. This consumes energy because the water has to be constantly heated every time it cools a little bit. When you have a tankless water heater no water is heated until you actually use it. The heating takes place on demand. So as the water passes through the heater it is quickly heated and quickly passes out of the water heater and to your faucet, shower, dishwasher or washing machine. Because the tankless water heater only uses to heat the water energy when you actually need it a lot less energy is used to heat the water for your home. The savings on your energy bill can be very significant. Also you will not run out of hot water because there is no tank to empty. The more water you need the more water is heated on demand as you need it. For example it is quite common that the kids believe the shower running and use of hot water. That leaves parents with nothing but a cold shower unless they want to wait for that tank to heat up all the water again. With a tankless water heater that concern is a thing of the past because you will never run out of hot water again. In addition standard water heaters have a large tank in that large tank takes up a significant amount of space often the size of a closet. If your water heater is inside your home as opposed to being in the attic chances are it’s in a closet. And if you replace that water heater with a tankless you’re going to get more storage space! Tankless water heaters are also built to last compared to standard water in fact heaters with a tank. One of the things that often goes wrong with the standard water heater is the tank. If the tank leaks a lot of damage can be done because tanks may hold as much as 100 gallons of water. That much water can damage your home in a big way. Tankless systems have no tank therefore even if they did generate elite it would be a much smaller and slower leak as opposed to many gallons of water at once. It is also far less likely to have a leak with the tank system. Tankless water heaters are a wise investment because they will last many many years longer than a standard water heater while saving you money month after month year after year on your energy bills. Tankless water heaters have become much more popular in the past couple decades in other parts of the world and now they are making serious inroads in the USA. Because they are far more energy-efficient and they require much less physical space which has made them a popular choice in Europe and in Japan. Now you can start saving money on your energy bills for years and years to come by getting a new tankless water heater installed by the professionals at Dallas-Fort Worth plumbing. We are your tankless water heater experts in Keller, Southlake and Dallas. Talk to us today about your needs and we will guide you to the tankless water heater that’s just right for you and your home. Heating water on demand and an endless supply of hot water that never runs out will put your mind at ease no longer having to worry about whether a family member or guest has emptied out that 66 to 100 gallon water tank leaving you with nothing but cold water for your shower. Tankless water heaters are also a great choice for commercial and business with the benefit of gallons and gallons of hot water available with the turn of a faucet. Tankless water heaters have different flow rates. This means that your choice of tankless water heater is based on the maximum amount of hot water you might be using at any given time. 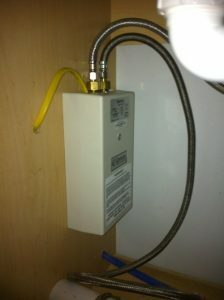 rather than having a specific tank size tankless water heaters have a flow rate that is measured in gallons per minute. The more gallons per minute the more concurrent showers and water use is possible. If you have a smaller home with fewer bathrooms and showers changes are a smaller capacity tankless water heater is the right choice for you. Larger homes with many bedrooms require higher flow rates. Very very large homes may require multiple units. Those same homes would obviously already have multiple tank style water heaters. However it is certain that even if you need multiple units you would still use fewer units than standard tank models. Of course the more standard water heaters you remove the more space you get in your home for storage. One example would be a tankless water heater with a rating of seven or more gallons per minute should be able to handle two showers at once plus an appliance such as a washing machine or dishwasher. One other thing to remember is that when you turn on the faucet you may have to wait a moment before the hot water arrives as the pipes between the water heater and your faucet must pass the cold water that has not been heated. After that water passes through your instant on hot water is flowing continuously for as long as you need it. For most homes a unit of 6 to 8 or more gallons per minute is the right choice. The efficiency rating of the tankless water heater is also higher than tank models. Tankless water heaters typically have an 80% efficiency rating compared to tank models with ratings in the 60s. Tankless water heaters are also likely to add to the value of your home because they are desirable for so many reasons. The gas company may also have a rebate for you. Check with your local gas company. How is a tankless water heater installed? First the home or business must be set up for natural gas. Tankless water heaters may be in the 200,000 BTU range and they often require a dedicated gas line. They also require a dedicated powerline to the unit as well on its own circuit. 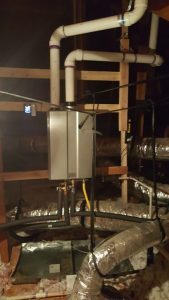 Optionally some homeowners add a battery backup system to allow for hot water use during a power outage. 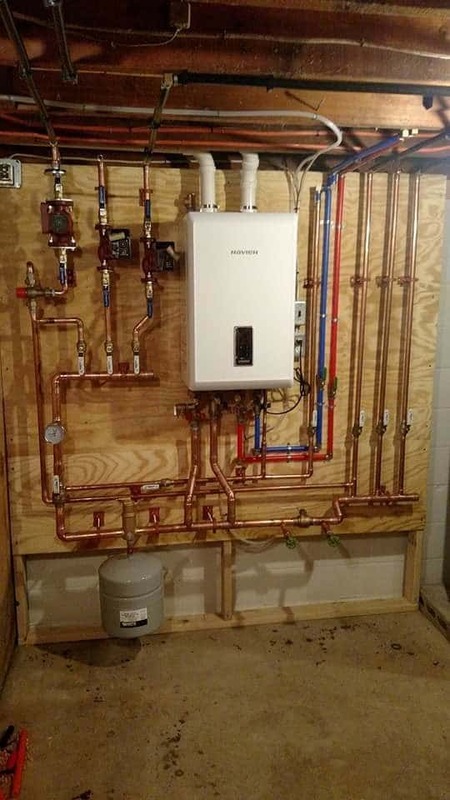 During new construction tankless water heaters should be considered because the installation process is far easier. If you are shopping for a new home getting a tankless water heater installed from the very beginning is definitely the way to go. Contact us and will speak with your contractor or builder. Installing a tankless water first requires that all of the pipe fittings are properly cut and attached. This includes copper piping or PEX attached to the unit to supply the water and direct the water out of the tankless water. Also the gas lines must be connected. More than likely this will involve running gas lines specifically for the tankless water heater. The temperature setting for the tankless water heater is adjustable however most often it is set to 125°. Should you desire a higher temperature you may adjust but be careful so as to avoid scalding. Tankless water heaters are a great way to save energy and enjoy all the hot water that you need for your family. Call us today at Dallas-Fort Worth plumbing and we can get you the tankless water heater that is just right for you installed quickly.